Today (6/22) ONLY, get this Melissa &amp; Doug Let's Play House! 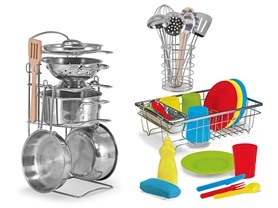 Kitchen Bundle - Pots &amp; Pans, Stir &amp; Serve Utensils, and Wash &amp; Dry Dish Sets for $36.99 (Retail $64.99). -Play set features shiny stainless steel cookware Mom and Dad would envy! -With two hardwood utensils included and stainless steel pieces polished to a gorgeous mirror-finish, this set is truly top shelf! -7-piece set brings a professional touch to play kitchens! -Set the perfect table for your play-food feasts and pretend parties! -BPA-free and dishwasher safe, the colorful pieces (in red, green, blue, and yellow) are perfect for real snack time, too!